I love how the juices bubble up through the crumble! Makes such a statement! There is something captivating about a perfectly ripe peach. Their natural sweetness and vibrant color bring summer to life. This time of year I like to take full advantage of them, so when I was asked to participate in the How2heroes lunchtime cooking series at the Cambridge Center Farmers’ Market I knew it was going to be peachy! I wanted to demo a dessert that would really highlight the peaches so I decided to go with my peach and almond crumble. Crumbles are fabulous for a few reasons. They really showcase the fruit you’re using, they are always a real crowd pleaser, and they are super easy to throw together. That last one is especially helpful when you’re doing this outdoors in about 95 degree weather! The demo went really well, and the crumble turned out wonderful! The secret ingredient in this crumble is almond extract. I added about a teaspoon to the peaches which gave the dessert an extra kick. I also added sliced almonds to the crumble topping which toasted up while the crumble baked lending an extra layer of flavor and texture to the finished product. This was the first time I was filmed live in front of a crowd, and it was a lot of fun! Everyone enjoyed the crumble and it was really nice getting to chat with everyone! While I was doing my demo I mentioned that I would add some sass to the crumble by serving it with a scoop of goat cheese ice cream. Later that evening I couldn’t get the goat cheese ice cream out of my head so I immediately got to work on my new ice cream! All I have to say is this is my new favorite ice cream! I used light brown sugar in it which melds perfectly with the goat cheese. You get this kind of earthy flavor first and then you get the slight tanginess from the goat cheese. I also made a cherry and Amaretto sauce to drizzle on top. The end result of this whole dessert is fabulous! First you have the warm peach crumble bursting with summer flavor. Next you have the cool and tangy goat cheese ice cream. 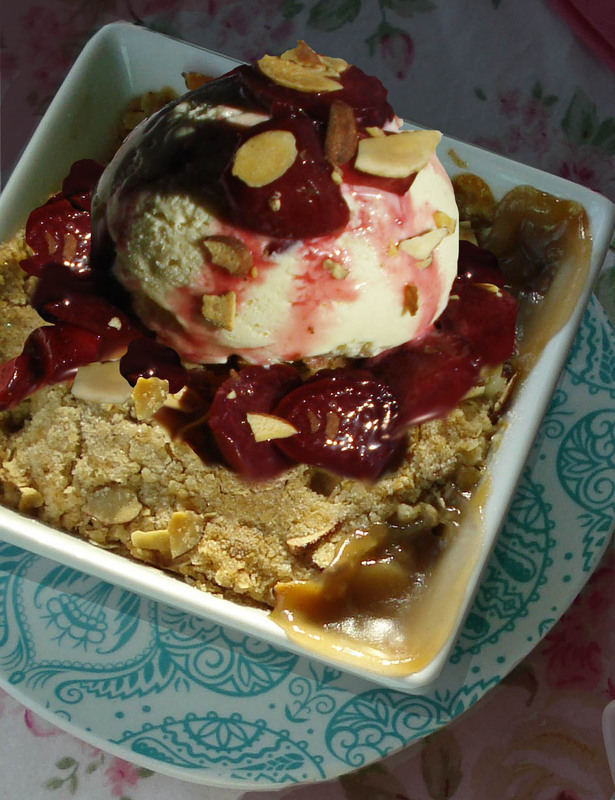 Last you have the cherry and Amaretto sauce which ties back beautifully to the almond flavor in the crumble. The crumble and the goat cheese ice cream are both great on their own, but served together with the sauce is simply divine! Toss peaches with 1/4 cup of sugar and almond extract and set aside. Mix together flour, sugars, and salt. Cut in butter with a pastry cutter, or pulse in a food processor till the butter resembles coarse cornmeal. Taste peaches to see if you need to add more sugar. Add flour to fruit & toss to coat. Fill 4 individual ramekins or a 9″x13″ baking dish with fruit. Pack crumble on top. Bake ramekins for 30-35 minutes, or 9″x13″ for 55-60 minutes till the crumble is golden and the filling is bubbling up through the crumble. Whisk yolks and brown sugar together in bowl and slowly add in hot cream mixture whisking constantly. Once you whisk in about half the cream mixture, transfer everything back to the pot. Cook over low heat stirring constantly till thickened, about 2-4 minutes. Remove from the heat and strain. Stir in goat cheese and light corn syrup. Toss cherries and sugar in a saute pan over medium heat till juices release and start to get thick and bubbly. Add in a good splash of Amaretto and let the cherries get happy for about a minute. Remove and serve warm over ice cream. >The cherry amaretto sauce is to die for! Congratulations on your firs live filming going swimmingly! The dessert looks absolutely scrumptious. >I just tried goat cheese gelato with cacao nib and I couldnt get it out of my head. So good! I can only image how good GC icecream with this crumble would be. >I love peaches when they are ripe and local. I can hardly wait to get up to our cottage in Ontario for ripe Ontario peaches! I've never tried goat cheese ice cream, I am intrigued! >Great recipe to demo, it looks fantastic. Glad you posted it here, bookmarked. Your pictures and description of the taste has caught my attention-yum! >This dessert looks perfect for all seasons! So creative in all recipes!! Thank you so much! >I totally agree with how you described the peach – captivating. And this crumble is captivating as well. I swoon over anything with crumble topping and I have been living on peaches lately, completely mouthwatering! >Ice cream sounds amazing the crumble looks fantastic. >This looks fabulous and that goat cheese ice cream looks amazing! >Wow! This looks amazing. I am totally intrigued by the goats cheese ice cream. Definitely going to give that a try! >Very nice recipe, I'm sure everyone enjoyed it. Peaches and almond are a match made in heaven. >Congratulations on this amazing dessert Meghan! And you certainly nailed it with the sauce. >I love peaches and goat cheese. Looks Yummy! 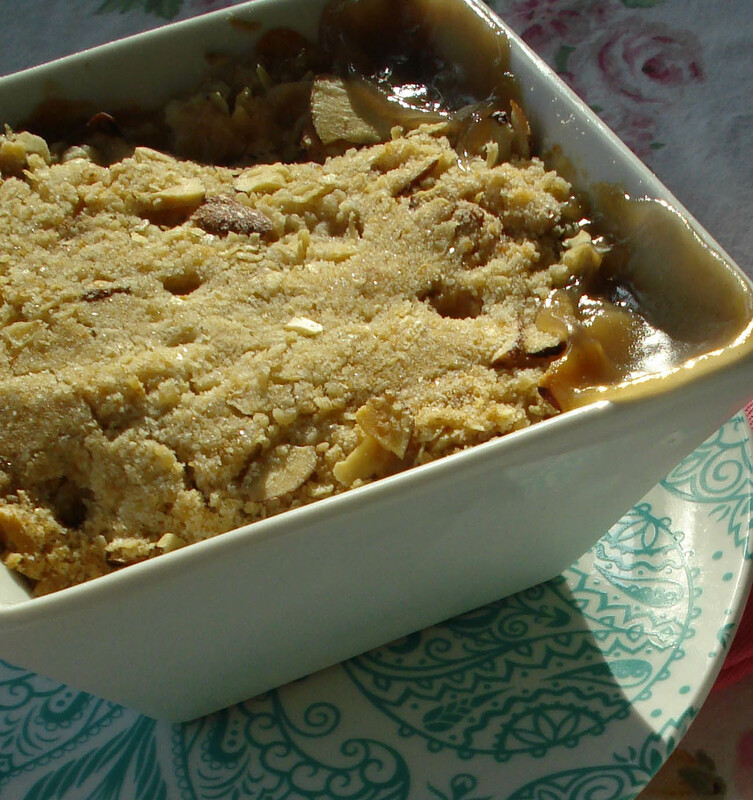 >I can never resist a good crumble and this one looks fantastic. Goat cheese ice cream on top….love it. Such a neat mix of flavors. >Those pictures are mouthwatering..really tasty looking!!! And i love the recipe! >Oh my goodness, it all sounds so, so fantastic! Glad the demo went well!! >What a fantastic idea to make goat cheese ice cream! The whole dish is mouthwatering. I'm glad you demo went well. >There is absolutely nothing about this that doesn't sound 100% crazy-delicious. >I really like the sound of the goat cheese ice cream. Like Heather said, it sounds crazy-delicious. Thanks for the recipes! >I love everything about this– the crumble looks so juicy and perfect (and I love the addition of almond) and Goat Cheese ice cream??? I must try this!!! A heavenly dessert! This is bookmarked!